Thank you again for great analysis. I applied in June 2016 and I am still waiting for petition approval. Our project got I-924 approval about a month ago. My Regional Centre is from well known big company with many approved projects. I suppose most of the people in my project still did not get approvals, so I am not an exception. I wonder, is there any correlation between time of I-924 approval and time when petitions of this regional centre start to get approved? I will have case enquiry date in less than 3 weeks, I think several people or more in my project already got case enquiry dates, hopefully this will help. While I cannot speak for USCIS, I could give a bit of anecdotal evidence. 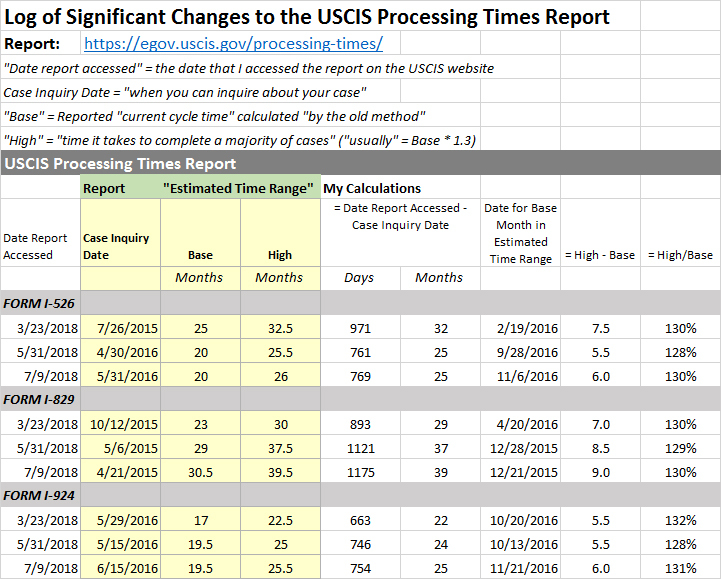 Based on my/my clients’ recent experience, USCIS has been postponing adjudication of I-526s until the I-924 exemplar has been approved. I believe your I-526 is probably in a similar situation. I forgot to add: this client’s I-526 was approved within 2 months of our firm’s response to the RFC. Thank you very much for sharing information from practical experience, Charlie. Charlie, I wanted to ask your advice. Do you think it’s worth it to try to contact USCIS about it and ask them if they need anything like what you described? Or it’s better to wait for their contact and not try to contact them? Vlad, I believe the best thing to do is reach out to your filing attorney on that matter. Thank you very much for fast reply and advice. Bo, could you please send me you project details to Penpalelina@gmail.com ? I am unfortunately one of the investors (with approved I-526 but no conditional GC) whose project was sponsored by the Vermont Regional Center. My project has nothing to do with Jay Peak, and so far has been successful in achieving its goal. The only reason I am now facing rejection from USCIS is because VRC was associated with Jay Peak. Can you suggest what options do I have at this point? My project is requesting USCIS to transfer all its investors to another regional center (which is owned by the parent company). I am not sure whether there is precedence where such a move has been successful? Thanks for your reply, Suzanne! As always, very thorough. If switching the RC doesn’t work, then what other options do I have left? Start over by filing a new i-526 is the option suggested in policy. But your project will have gotten better advice than i can give on options and prospects, so consider what they and your lawyer have to say. Also, is there precedence where USCIS kept issuing conditional GCs/approving I-526s while the RC was appealing the termination? Is there any statistic report of how many Eb5 investor actually become US citizen? Of the naturalization data I know, none identify LPR origin by visa category.